I can’t help myself… I’m providing you with yet another salad dressing concoction. That said – this one is a bit different from the majority of the dressing recipes I’ve posted here. 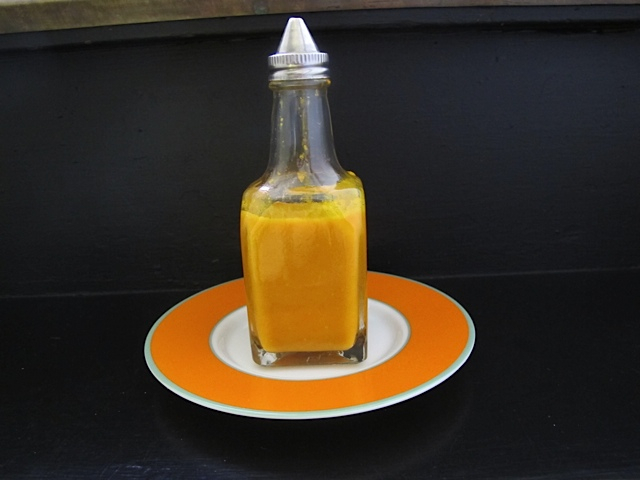 Carrot miso salad dressing…made with carrot juice, ginger and white miso. Sounds pretty hippy dippy – right? It harks back the era I recall from the 1970s. I must reveal I did participate in bread baking and natural foods back then – but I didn’t go overboard with the hippy thing. Nonetheless, I laugh every time I make this dressing, remembering how everyone my age, when they were in college, ordered carrot juice, wore bell bottoms and cooked their hearts out. Salad dressing is one of those things where I just scratch my head when I see folks buying a bottle of commercial dressing. I make literally hundreds of salad toppings but mostly I just drizzle olive oil or walnut oil , add citrus or vinegar of some type, herbs or seasonings or shallots and voila! Generally this takes me about five minutes at best. This salad dressing is a little more involved but completely worth it. When I prepare it there is enough to last us a couple of weeks – plus it’s healthful and has a vivid orange color to entice your taste buds! In a small sauce pan, heat and boil the carrot juice, stirring or swirling the pan occasionally until it is reduced to three tablespoons. This takes me around 10 to 15 minutes. Pour it into a measuring cup and refrigerate for ten minutes to cool. Add the reduced juice and everything else but the oil to a food processor or blender. Whirl it, and slowly drizzle in the oil. Process until smooth and there are no remaining chunks of ginger or carrots. Put it in a jar and refrigerate! This is fantastic served on romaine lettuce with lots of veggies and some chicken or leftover sliced meat or fish. Or use it as a dip for shrimp, veggies, steamed broccoli, salmon, or chicken breast. This keeps up to two weeks refrigerated but you will need to shake it. Yummy, no joke! 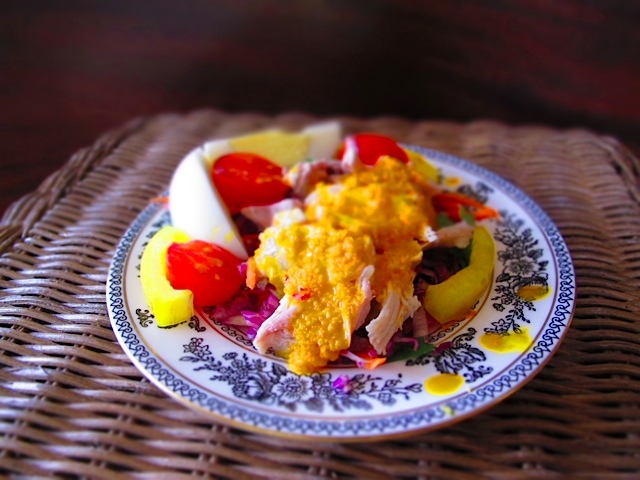 This entry was posted in Condiment, Salads & Dressings and tagged Carrot, Carrot Miso Dressing, Miso. Bookmark the permalink.